Carlo Biagioli S.r.l. 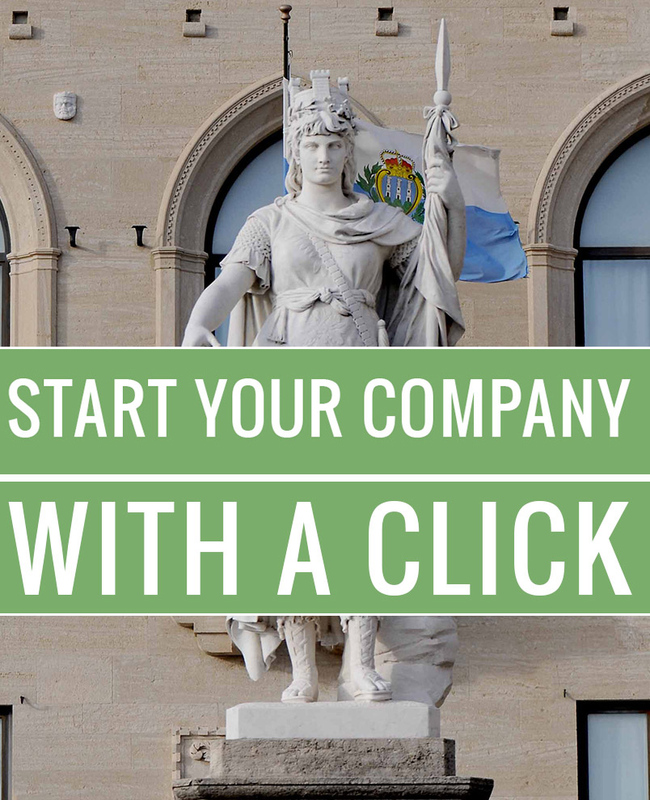 - How to start your company in San Marino! Business profit is one of the discernments for deciding to invest as It pays the investors and it favors the self-financing. The Fiscal flexibility of the Republic of San Marino certainly stimulates the production sites togheter with the considerable advantages of transport routes, of areas and of adequate facilities, of relations with the institutions and of workforce availability. In addition, the possibility given by law to hire "cross-border" employees and people with special skills for management and highly professional positions is another factor that spots the convenience to choose San Marino for starting business activities. 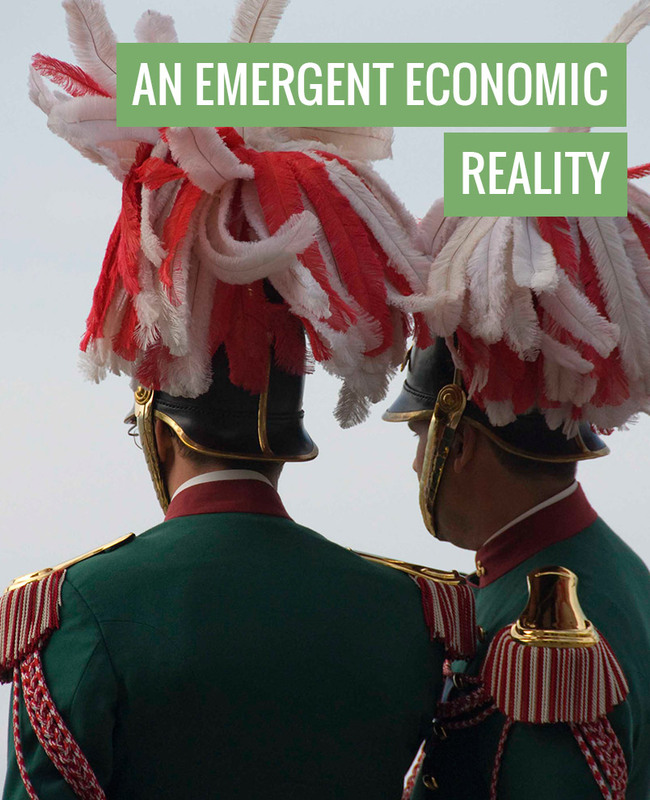 Among other things for entrepreneur and managers there is the opportunity to take up residence by living in the Republic, which would improve the net income from any kind of job, despite the substantial equivalence classes for wage positions with neighboring Italy. The entry of San Marino in the "white list" has defined the normality of the relations and initiated procedures for the entry in the European Community Economic Area which will favor further commercial trades. 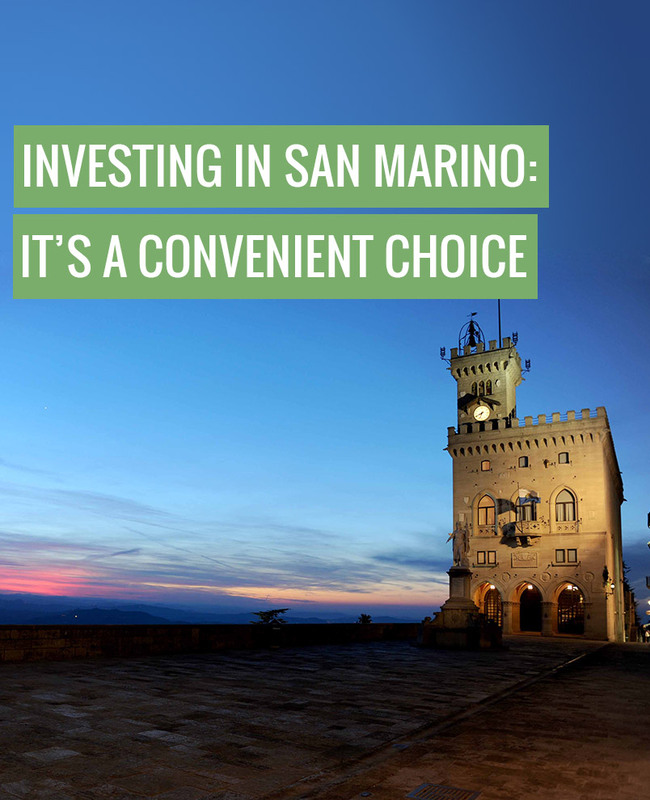 The following information are incentive to spot the convenience for investing in business activities in the Republic of San Marino. The minimum share capital amounts to € 77,000.00 and the half of it must be deposited, in a bank of San Marino, within 60 days of the enrolment in the Register of Companies. The remaining 50% must be paid within three years. If the Limited Company is the sole shareholder, however, the share capital must be paid in a single instalment within 60 days from the day of entry in the register of companies. It is mandatory to appoint a Unique Auditor and if two consecutive financial years reach the volume of sales or services exceeding the value of 7.3 million euro, the establishment of a Board of Auditors (composed of at least three members) is required.The majority of the Board of Auditors must have the actual place of residence in the Republic of San Marino. The average cost for setting up a S.p.A. (Deed, stamp duties, taxes and commercial registration) is approximately € 5,000.00. The minimum share capital amounts to € 25,500.00 and 50% of it shall be deposited in a bank of San Marino within 60 days from the enrolment in the Register of Companies. The remaining 50% shall be paid within three years from the enrolment. If the Srl is the sole shareholder, share capital shall be paid in a single instalment within 60 days from the enrolment in the Register of Companies. A Single Auditor should be appointed when capital is equal to or greater than € 77,000.00 or if during two consecutive financial years the volume of sales or services exceeded the 2 million euro. The Board of Auditors (at least composed of three members) is required when for two consecutive years the volume of sales or performance exceeded the value of 7.3 million Euros. The majority of members of the Board of Auditors must be effectively resident in San Marino. Average cost for setting up a limited liability company (notarial deed, stamp duties, taxes and company registration) is approximately € 3,500.00. It is not required a minimum share capital. Shareholders have unlimited liability of the company's debts. S.n.c are escluded from the double taxation agreement. f) He/she is resident in the "Countries under monitoring" as identified by the Financial Intelligence. It is the subject of enforcement actions by the Department Esattoria of Banca Centrale della Repubblica di San Marino, pursuant to Title II of the law 25 May 2004 n. 70, aimed at recovering amounts due from the Public Administration or public sector entities which are not disputed or have not entered into an agreement for the payment by installments strained extinction of the slopes. The type of managing (individual or collective) is up to the Shareholders. Sherholders decide also the powers of the Manager, putting an economic limit for the ordinary and extraordinary administrative operations. Self-certifications of pendig charges cannot be allowed for the foreign citizens, it must be original and valid (within six month of the issue date) translated and certificated in Italian with a consular compliance certificate. The company certificate (or an equivalent certification, translated and certificated in Italian), must be original or in a true copy and valid, issued at least six months before and it is necessary for legal people. S.r.l., S.p.a. and S.n.c. are required to approve the annual financial report within 5 months after the end of the financial year. The approval of the budget is presented during the shareholders' meeting and a copy of both the resolution and the annual financial report shall be deposited at the Economical Activities Office of the Republic of San Marino. In the Republic of San Marino economic initiative is free, except for certain commodities sectors and/or business, whose goodwill is subject to prior authorization by the Congress of State (the Council of Ministers of San Marino). The business objectives expressed in the articles of incorporation should be lawful, feasible and consistent (for example, it’s not allowed to combine the wholesale fish and the sale of candles). business where special laws allow its authorization. For the activities of trade wholesale it is not required a majority of corporate shares held by residents. The only constraint is the number of holdings with fiduciary mandate. Retail business is free and can be a company composed also by non resident members, with exception of business in the historical centers. Companies must have their registered office in the Republic of San Marino and they should provide appropriate work spaces, used exclusively for the purpose of the company. The rent per square meter for the registered office of approximately 100 square meters varies from a minimum of € 60.00/sqm to a maximum of € 70.00/sqm per year. The rent of the areas designated to production or to warehouse varies from a minimum of € 35.00/sqm to a maximum of € 45.00/sqm per year. Real estate leasing: in the Republic of San Marino property leasing is very used tool and from the fiscal point of view allows the tax deductibility of both the share capital and the interest. None of the shareholders has performed business related to the activity for which they ask the abovementioned benefits the year prior to the application date. The company hires at least one employee within six months from the issue of the business license, and another two employees within 24 months (including the administrator). Two advances to be paid by July 31 and November 30, 35% the first and 55% the second, on the previous year taxation. The profits from 1 January 2014 paid to individuals by corporation are subject to a withholding tax. Note: Tax exemption for the first business license issued and for the next three fiscal years. Exemption from costs of issuing and renewing of the license for a second, third or fourth license. - none of the shareholders has performed activities related to the activity for which they ask the aforementioned benefits in the year prior to the application date. The amounts are doubled if the revenue from ordinary activities in the previous year exceeded EUR 300,000. Fron 2019, the tax will be reduced to 75% and 50% in 2020, and then becoming extinct from 2021. Note. Exemption for the first 6 exercises. Unit value exceeding € 250 (covered trucks but also need specific certification on the book). The vehicles usually have reduced rate, except when: are convertible, have less than 5 seats, maximum displacement 3,000 cc diesel, 2000 cc petrol. Deductibility of all cost as long as inherent to the achievement of revenues or income that form the business income , with the exception of certain types of costs that can be deducted from the value in percentage of revenues for sales and services (advertising and sponsorships to the limit of 8%, data processing and market research to the maximum limit of 10%, expenses up to a maximum of 5%). Full deduction for the first financial year regardless of the month of the year in which the property could have been used, with the possibility of an early amortization (excluding property) for the first two years (up to 20%). Lease finance: possibility of deduction based on the duration of the contract (also for fixed assets tax depreciation allowed is 3%). Minimum duration of lease Financial: 24 months for movables, 48 months for fixed assets (tax, however, the minimum duration of the contract is assumed to 8 years). tax rates and tax brackets taxation of income of individuals. Withholding applied on the profit distributed. On the profit rate applied to the border, to separate taxation. tax deduction to natural people for dependents, and more deduction if the dependents are more than two. expenses for interventions to real estates in order to prevent someoneelse's unlawfull acts (maximum € 2.000). Retained earlnings for investment in capital goods in the same enterprise are exempled. TIES: Having at least 1 permanent employee. TIES: Having at least five permanent employees (or three if residents). Reduction of the tax base for economic operators that increase the average number of workers. Requirement: having already at least five permanent employees, or three residents, (10 units if industrial production). Women reintegration into workforce after maternity leave. 40% for new sectors or for those sectors which are considered to be strategic for the economic development. Incentives for companies with a technological or innovative scope. the difference between the value of investments and the price paid by the shareholder-employee does not form part of labor income. exemptions on capital gain, achived by non-businessmen who contributed in Start Up if only the amount is re-invested in other societies with the same activity and built up since not more than 3 years. exemption of capital gains realized by non-entrepreneurs from the sale of shares in Stat up provided reinvested in companies involved in the same activities and consist of no more than three years. Soft credits are aimed to new economical activities, to the certificarion, diversificarion and reinforcementof existing companies. Excluded from benefits: a) who carries out banking, financing and leasing activities; b) economic oprators who is domiciled in others house, except if the credit is aimed to the purchase of their own domicile; c) societies that practice real estate business only. A requirement is to be licencee of industrial, services, handcrafts and commercial active business. It is granted to those who requested for a licence and committed theirself to hire 1 permanent employee, from the unemployment register, within 6 months after the inclusion on the register, or there will be the suspension of the credit. Only if in the last year, at least 2 permanent employees have been hired in case of a society and just 1 if individual. The maximum loan lenght is 5 years with a contribution of 70% of the subsidized rate by the State. The total amount of the purchasing devided for the square meters, with at least 50 mt for employee. The maximum loan lenght is 10 years with a contribution of 70% of subsidized rate by the State. Purchasing of intangible assets, of industrial patent, rights to use copyrights. The maximum mortgage lenght is 5 years with a contribution of 70% of the subsidized rate by the State. Also a partial project to re-rank, modernize and/or change the object of the society at the condition to hire at least 2 permanent employees, 50% of them from the unemployment register, within 60 days after the authorization. The maximum mortgage lenght is 5 years with a contribution of 100% of the subsidized rate by the State. Only if in the last year, at least 2 permanent employees have been hired in case of a society and just 1 if it is individual. The maximum loan lenght is 5 years with a contribution of 70% of subsidized rate by the State. The maximum mortgage lenght is 10 years with a contribution of 70% of the subsidized rate by the State. The maximum mortgage lenght is 10 years with a contribution of 100% of the subsidized rate by the State. Only if in the last year, at least 2 permanent employees have been hired in case of a society and just 1 if it is individual, or if it is an artistic handcraft activity with no employees up to € 50.000,00 of soft credit. For managers of hotel facilities, open-air structures, houses and flats for turistic rent, rural turism (art. 14,15,16,17,18 law 27 January 2006 n. 22) and for logistics, transport storage, the parameter of proportion sqm/nr. of Employees is not applied, but the maximum credit is € 1.000.000,00. The maximum mortgage lenght is 10 years with a contribution of 70% of the subsidized rate by the State. It is possible to get within 2 years. if the share is held by an Italian company. if the share is held by an Italian S.n.c. As of October 2017, the following jurisdictions have signed with the Republic of San Marino agreements against double taxation currently in force. Austria, Barbados, Belgium, Cyprus, Croatia, Georgia, Greece, Italy, Lichtenstein, Luxembourg, Malaysia, Malta, Portugal, Qatar, Romania, Seychelles, St. Kitts & Nevis, Hungary, Vietnam, Azerbaijan, Singapore. Andorra, Argentina, Australia, Bahamas, Canada, China, Denmark, Faroes, Finland, France, Germany, Greenland, Guernsey, India, Ireland, Iceland, Monaco, Norway, Poland, United Kingdom, Czech Republic, Samoa, Spain, South Africa, Sweden, Swizzerland. Below the simulation of an employee of 3rd level employed by a firm of San Marino. It is aimed to promote hiring of people from unemployment register. There is no minimum hiring level. from the 37th month to the 48th: 8% in charge to Cassa Ammortizzatori, and the rest to the company (92%) if there is a third level hiring. N.B. Incentives mentioned above are halved under the second level. Tax reduction of 20% for maximum 36 months and if it is a permanent hiring. Hiring can be permanent or fixed-term contract. N.B. If it is a fixed-term contract, there is only the 50% of tax wages mentioned above and no tax reduction, otherwise the abovementioned incentives will be applied. If the emplyer does not tranform the contract into a permanent one within 6 months, the company will lose its right to tax wages, but it does not have to reimburse the past benefits recived. Otherwise, if the contract is transformed into a permanent one, the employer has full rights to tax reduction, plus the full tax wages for the rest of the contract, since the tranformation is done. a woman in the unemployment part-time register, hired for a new job, less than 25 hours a week. to favor the position or ricollocazione contemplated of workers that need formative activity to practice the in demand duty. 100% of wage taxes if the person has attended a training course at the professional training center. Reserved to young between from compulsory schooling age to 23 years old. Granted to young people at their first job, registered on the lists of job placement, in possession of Certificate or Diploma professional qualification, diploma of higher Secondary School, Bachelor's Degree, Master's degree, specialization courses and postgraduate degree in tasks related to educational qualification. The apprenticeship period may not last more than two years. The intake is indeterminate period of time. No contributions are due. To reintegrate workers registered on the lists of job placement, who receive IES or unemplyment benefits. The worker shall be hired for a job almost identical to the previous one, or similar to the job for which he/she received the allowance, or a job related to his/her professional qualification. The integration must be coducted at the same working level, or at most one lower than the previous one. Income tax deductions of 20% for employers for 36 months if the hiring is permanent. In case of temporary employment contracts, the employee is entitled to receive both 100% of the contractual salary and 50% of the aforementioned incentives. Note: each of the abovementioned incentives and tax deductions increase by 15% when hiring vulnerable categories. 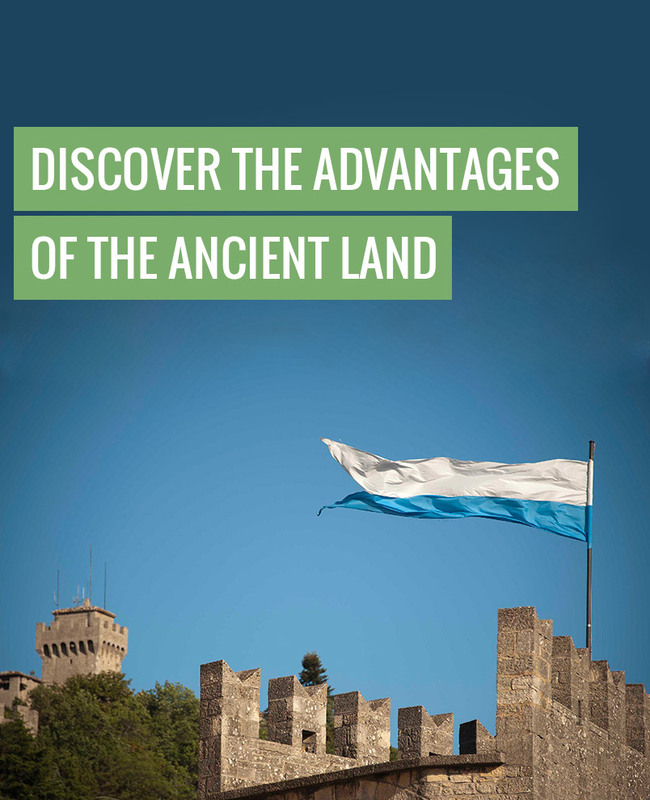 Those who invest capital or they have already invested in land in productive activities with guaranteed employment commitment for the purchase of industrial factories, by the production of specific business plans, in research or in areas of particular interest for the State of San Marino. if the applicant has any impediment to entry, transit or stay in countries of the Schengen area, reported or well-knowed to the local police. Who owns at least 51% of a company share capital can apply for permanent residency in the Republic of San Marino provided that he/she offers a "full time" job to 1 or 3 persons registered on the list of job placement, depending on the company's business sector and creating a guarantee deposit in favor of the State of Euro 75.000,00 for the first two years up to € 150.000,00 for the follwing years. The guarantee in favour of the State may consist in a bank deposit or by bank or insurance guarantee released by a supervised entity and it can be subsequently transferred to a property (residential or industrial) of a minimum value of € 150.000,00. Permanent residency for who owns at least 51% of a Sammarinese company share capital is extended to spouse or cohabitant as well as children up to 25 years old. To apply for the residence permit for business reasons he/she must demonstrate that he/she has an accomodation and an adequate income for self-sustaining. Validity of the residence permit: 12 months, renewable for maximum 5 years. The residence permit is extended to spouse, cohabitant and children up to 25 years old. b) invest in a certificate of deposit for 10 years of at least € 600.000,00. In this case, the State requires one-time payment of € 10.000,00 when issuing the permanent residency. The permanent residency can be extended to spouse, cohabitant and children up to 25 years old and for each relative it is required a one-time fee of € 20.000,00.
Business projects aimed at the realization of one or more investments in the Republic of San Marino allow to highly skilled employees as well as to their relatives the access to the simplified procedure for obtaining the permanent residency. purchase a property worthing at least € 300.000,00, or sign a financial lease (with an initial payment of at least € 300.00,00). In both cases it is being provided a special privilege on the propriety in favor of the State as a guarantee of the reimbursement of the economic benefits (taxes, contributions, credits, employees) granted. Managers and shareholders who are employees of companies which get qualified, under Decree 116/2014 and subsequent amendments and additions, as "High-tech Start Up" can obtain the residence permit for themselves and their relatives. Please contact Carlo Biagioli Srl. Carlo Biagioli Srl is available to support and a assisting having the advantage of talking to a single office. Carlo Biagioli S.r.l. through the professional collaboration guarantees a "turnkey" for the performance of all the paperwork and administrative provisions necessary for the establishment of any type of company. Carlo Biagioli S.r.l. through the collaboration of trusted professionals can assist the new company in the process of startup, accompanying the customer in the new tax dimension of the Republic of San Marino. Carlo Biagioli S.r.l. provides a recruiting service for various business needs from the simple worker to the engineer. Carlo Biagioli S.r.l. through the extensive experience gained by its employees in the financial sector is able to provide support in finding credit and funding by the banks of the Republic of San Marino, to get the best conditions offered by the financial market. Follow us on social to always stay in contact with us. The site aprireunaimpresasanmarino.com The site aprireunaimpresasanmarino.com has informational purposes only major economic administrative aspects related to the business activities in San Marino and therefore does not constitute a direct offer to the public and can not be considered a scientific platform. The information and examples are taken from laws, decrees, publications and experience at November 2018 (except for errors, inaccuracies, deficiencies and subsequent law additions) and are not intended to substitute professional advice or legal, tax, financial or administrative, being mere publicity campaign. The information furnished by Carlo Biagioli Srl, owner of this site, are not intended to promote any kind of crime, in particular fiscal or financial. The displayed information, examples, simulations and services, are aiming to encouraging the establishment of real companies in San Marino, but can not be considered exhaustive for the start and management of a company in San Marino.